TrendsTab.com (search.trendstab.com) is a search engine that sets itself on the Google Chrome browser after users install the extension called TrendsTab. This piece of software belongs to the infamous SuperWeb family of software, and it can be easily downloaded from trendstab.com or the Chrome Web Store (chrome.google.com/webstore/detail/trendstab/fnjbpdhhdalaalamiieicdjiflbikbdk). Even though this software can be downloaded from such a source, it does not mean that it can be fully trusted. Actually, the majority of users install the TrendsTab extension only to be able to “find out what’s trending today;” however, they also notice that the settings of their New Tab pages have been changed, i.e. TrendsTab.com has been set. Unfortunately, we cannot guarantee that TrendsTab.com is a trustworthy page. Besides, we have managed to find out a suspicious fact about it. Therefore, in our opinion, it would be best to get rid of it. If you have already installed the TrendsTab extension, you will see the TrendsTab.com page every time you open your New Tab page. This page looks quite trustworthy at first glance; however, we definitely cannot call it fully reliable, so it would be best to get rid of it. First of all, it has been observed that TrendsTab.com will redirect all the searchers to Search.us.com. In other words, you will be taken to this website after entering a keyword into the search box of TrendsTab.com. Nobody knows whether this third-party site can be fully trusted, so we recommend being careful. Actually, it would be clever to eliminate TrendsTab.com completely because it is known that untrustworthy pages might display advertisements and all kinds of sponsored links to users. It is dangerous to click on them because you might end up on some kind of website containing malware very quickly. Furthermore, you should also know that questionable pages like TrendsTab.com might also record everything you search for. To make sure that nobody can do that, you should delete the TrendsTab extension together with TrendsTab.com ASAP. Change your search settings to search.trendstab.com. As it will perform so many activities, there is a huge possibility that you will experience problems associated with the system’s safety one day. To make sure that the TrendsTab extension cannot record information about you, share it with third parties, and cause you problems, you should remove it. We are sure that you will find another way to find out more about trending things. 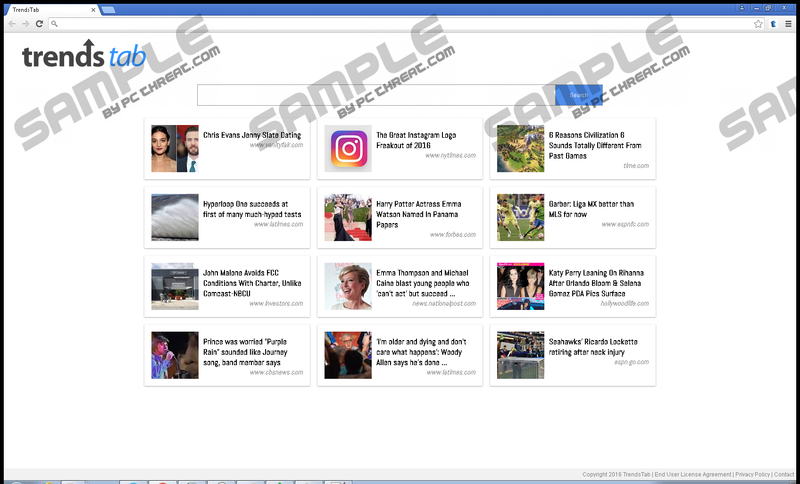 As you already know, the TrendsTab extension is available for download on its official website and the Chrome Web Store; however, not all the users download and install the extension willingly. Specialists say that it is very likely that this extension can enter systems without permission because it tends to travel bundled with other untrustworthy applications (usually freeware and shareware). Also, the extension might be distributed somehow differently too, for example, users might see pop-ups offering to add it. Of course, this extension and TrendsTab.com itself are not the only ones, so you have to be cautious and take care of the system’s safety in advance. All you need to do is to install security software on the system. Of course, you have to be cautious yourself as well. For example, it is advisable to be much more careful on the web, do not click on strange links, and download only trustworthy software from trustworthy sources. If you do not know whether the program is 100% reliable – do not download it. Luckily, it is rather easy to make TrendsTab.com disappear from the Google Chrome browser. You can either reset your browser, or you can simply delete the TrendsTab extension. We really hope that below-provided instructions will help you to get rid of it; however, if you still find it extremely hard to do that, you should acquire SpyHunter (its free version can be downloaded from our website) and then perform the system scan with it. Find the TrendsTab extension and click on the recycle bin button placed next to it. To make sure that other untrustworthy programs do not hide on your computer, scan your PC with a reliable automatic scanner. Quick & tested solution for TrendsTab.com removal.